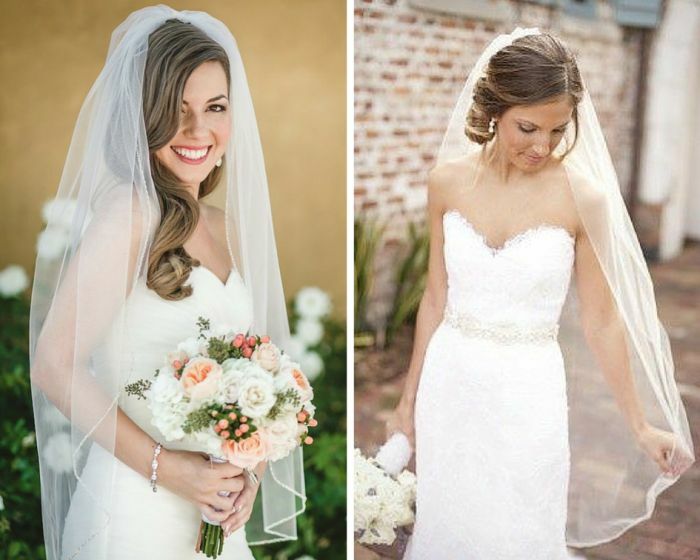 We all know that wedding day fashion is almost all about the dress. 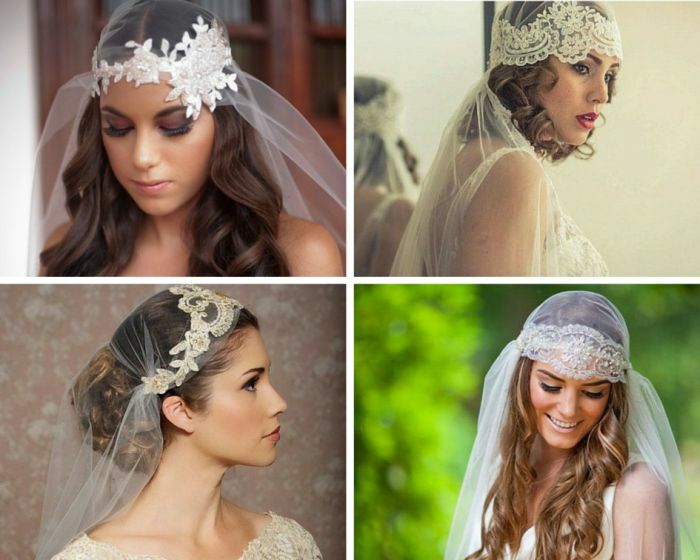 However, another similarly important accessory to go with that glamorous wedding dress of yours is the veil. Despite what many brides may think, it doesn’t all boil down to the one simple question of veil or no veil? We’re afraid there is a lot more questions you need to ask yourself after choosing to wear a veil. Such as, which length do you go for? What type of fabric? We hate to pile your plates with more jargon and questions when they’re already full of wedding plans as it is, but we’re afraid you do need to know the correct terms if you are going veil shopping. Yes, there are quite a few. Don’t fret, however, as we have this subject completely under our belts and have constructed an oh-so-easy breakdown for you to follow. 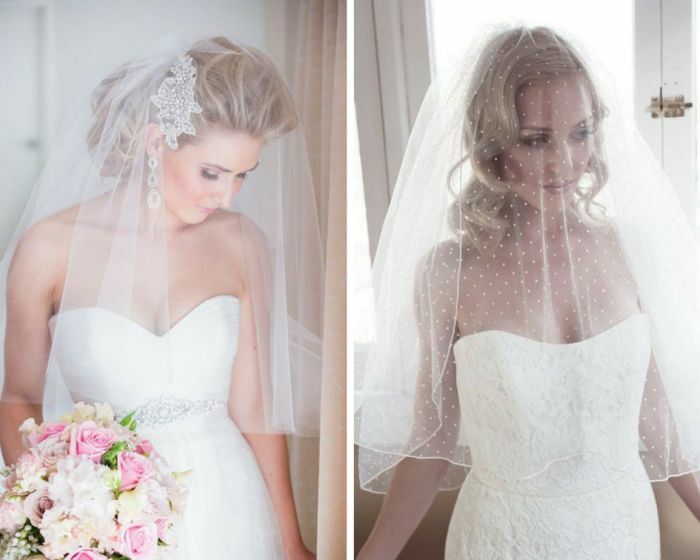 From length and style to the types of fabric they come in and how to keep them from flying away in our lovely Irish weather, we have compiled everything you need to know about wedding veils. 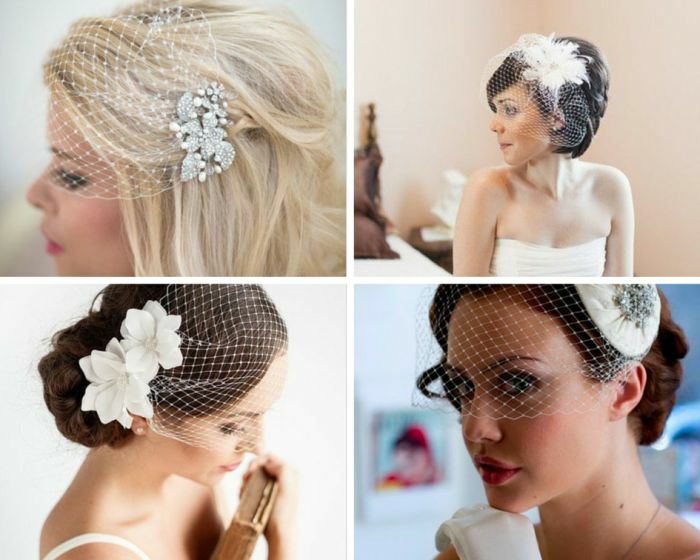 After this, you’ll know your birdcage from a Juliet cap just like a wedding pro. 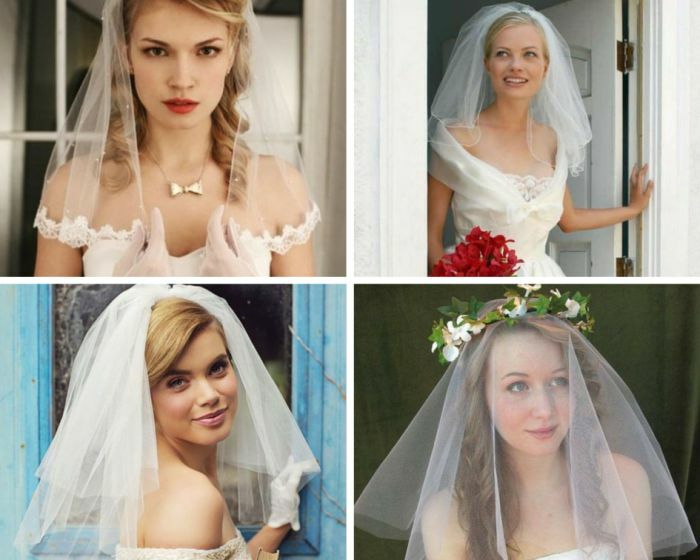 These are the smaller, daintier version of the wedding veil. Typically, they come in a form of netting with a predominant sequin or flower piece as the focal point. They can be worn most commonly in two ways – either as a bandeau wrapping delicately around the eyes to sit at each edge of your forehead, or as a gathered cascade beginning from the tip of your crown, down to roughly your nose – hence the term birdcage. These dainty veils are best known for a classic, more timeless style that adds the perfect amount of ceremony to the gown without making it appear too crowded or busy. The point of a birdcage is to shyly hide the eyes and drawing attention to the bodice of the gown. For that ultimate old Hollywood look, pair your birdcage veil with a pair of elbow length gloves to give you a glamorous edge. A blusher is the next step after birdcage when it comes to length. Only, this type of wedding veil is predominantly made from chiffon or tulle and reaches just roughly at the chin or lip line. It provides the same aesthetic purpose as the birdcage, to hide the face in a shy, coy manner and allow the bodice of the dress to be seen and admired. Only, the style of the fabric means that this it covers the face in a more solid sheath of material, making it that bit more demure than the net of the birdcage. It can be worn at the tip of the crown, and then can be flipped back off the face after the ceremony to make an elegant hair piece, usually best paired with an updo. 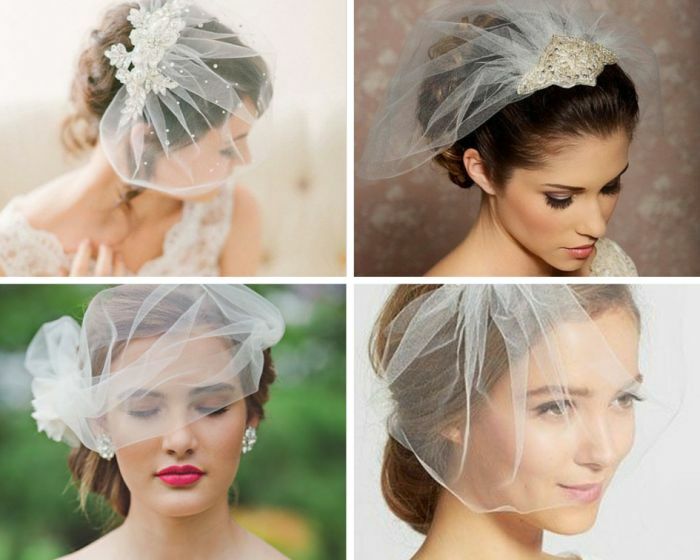 A blusher veil is perfect for an injection of both tradition and a little bit of fun on your wedding day. This is a very popular style of wedding veil that many brides will see being worn in aid of the retro glamour of the roaring 20s and 30s. A definite style piece, a Juliet cap involves the veil trailing the hairline on the forehead until it comes to a close on each side of the head, where it then opens into a cascading veil of tulle that flows out and down the dress. Juliet caps are a very elegant and charming style choice, bringing some art deco luxury to the gown. The design on the cap itself can range from appliqued lace to sequins and crystals, usually with a tie or point of fastening at the base of the neck or the side of the forehead. These veils are luxurious and a real style piece, perfect for any bride who wants to make use of her wedding veil, something that is ornate while not smothering her face in fabric, instead trailing down the back of the gown. 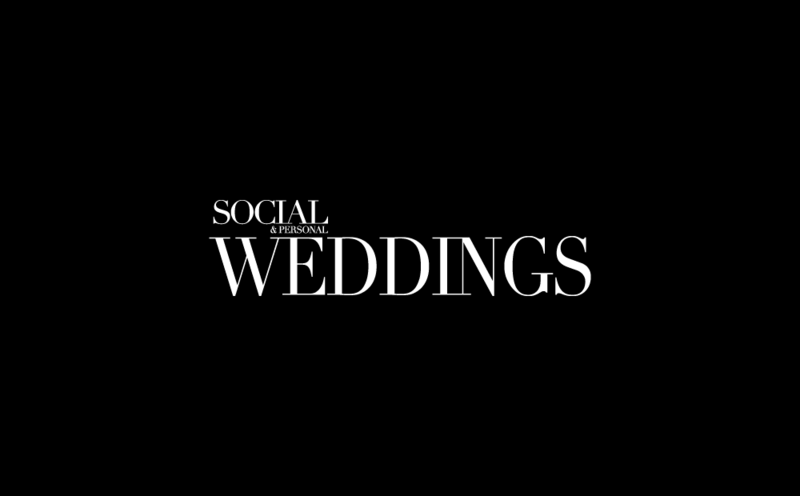 The variety and choices you have when it comes to deciding on a shoulder length veil are ruled by the same determining factors as almost all other wedding veils – the tiers. With a shoulder length veil, you can choose to opt for a sing layer that drapes elegantly around the face and brushes the shoulder, or a double tier. A double tier usually involves a lot more volume around the face, making it appear like an elongated blusher style veil. These shoulder length veils work best with gowns that have a strapless bodice or sleeves that drape off the shoulder, as they just skim the collar-bone and shoulder line, ensuring that the skin on show is still hidden with some mystery and a flattering edge. 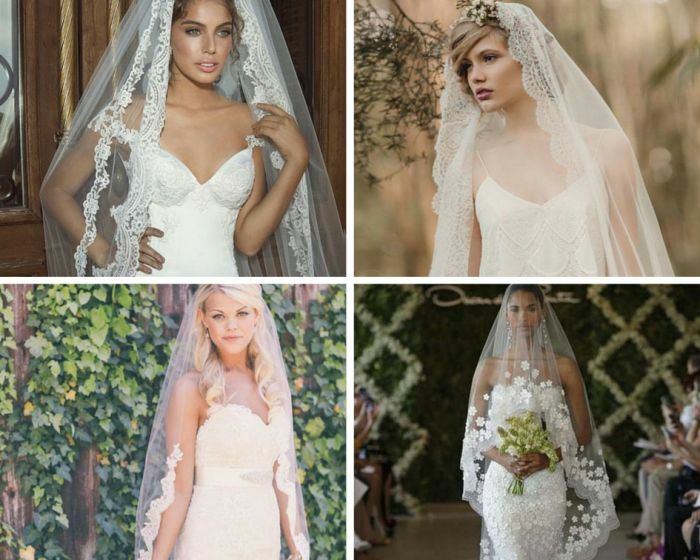 These are the slightly longer wedding veils that many brides opt for. Usually consisting of a layer of tulle, they allow you to experiment a little more with styles and designs than the shorter version would have allowed. With these length veils, brides can choose to have them in sheer tulle, with or without a blusher to allow that volume up top and a range of designs. Lengthwise, they do exactly what their descriptions say. One comes to just above the elbow, while the other floats around the fingertips. 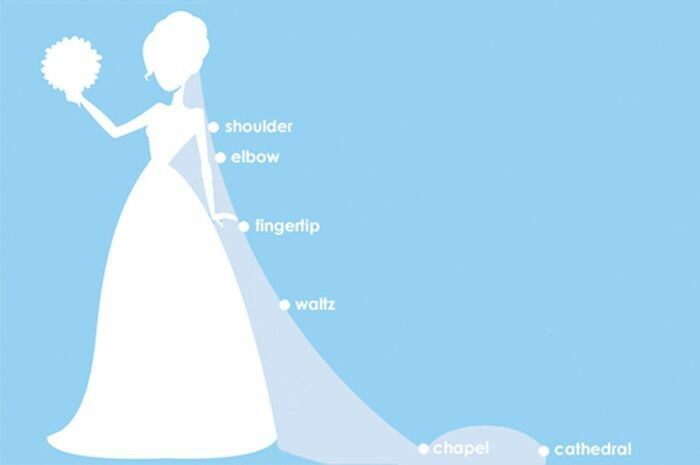 The extra length in the fingertip veil means that it creates more of a cascade around the body of the dress. Depending on the style and level of embellishment your wedding dress will have, if you want a veil this length that will flatter your height and elongate your frame, you can determine the level of adornment you want. As a general style rule, if you have an ornate, heavily detailed dress then you should opt for a slightly modest veil, and the same for a simple wedding dress that will work with a more decorated, lavish wedding veil. 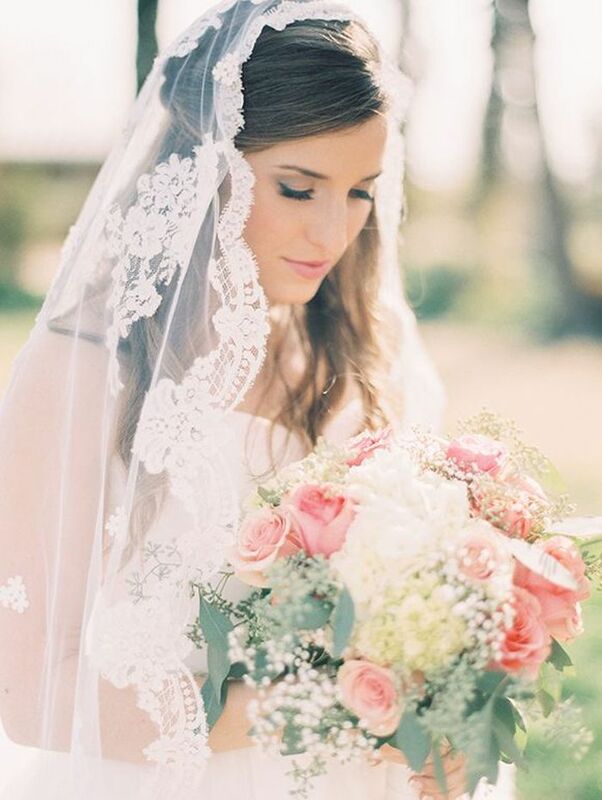 Quickly becoming one of the most popular among brides, the mantilla veil is a traditional Spanish style veil that is always embroidered with a lace edge. It usually comes without any extra tiers, consisting of just one layer of tulle with detailed, masterful lace in a scalloped edge. It can be worn at any length, but the more popular ones are usually longer, coming to a waltz-style length that reaches just midway between the calf and heel. A mantilla wedding veil is simple, traditional and a beautiful accompaniment to any wedding dress. Last but not least, this is the most ornate of all the wedding veils. 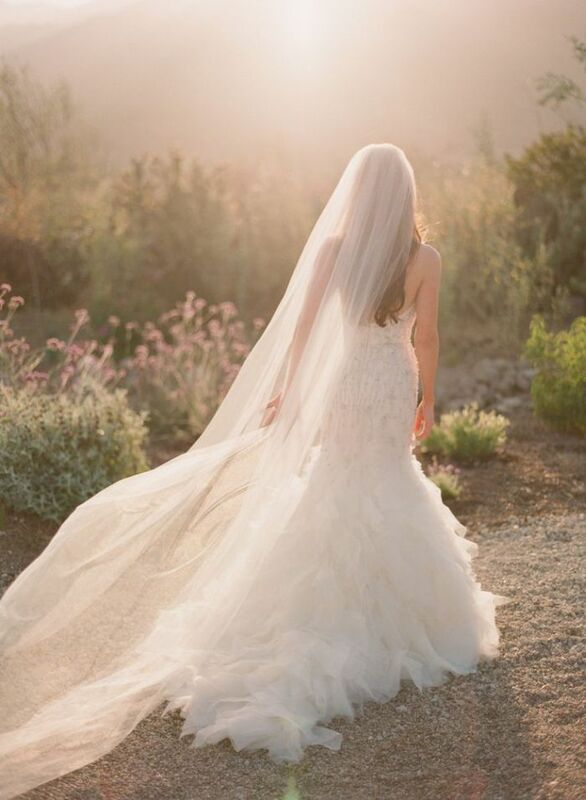 A cathedral veil is the longest style veil you can get for your wedding day, with many boasting a long trail after your dress of up to a whopping 150 inches. Called cathedral for a reason, a trail this long was meant for a long church entrance. 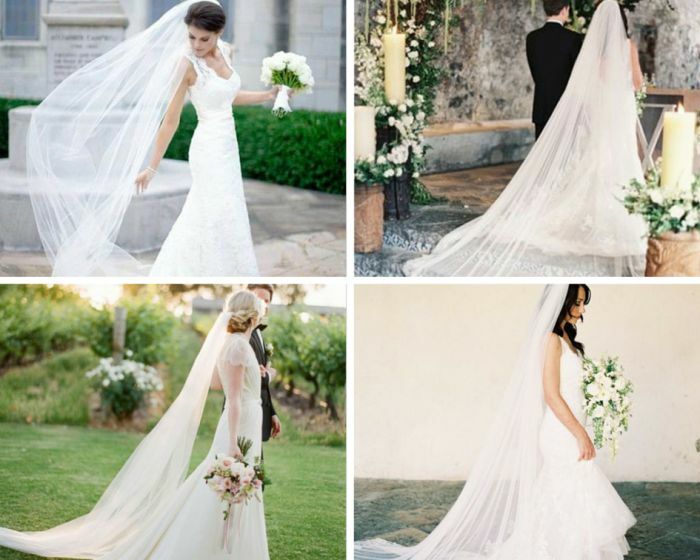 These veils are no doubt the most traditional among bridal veils, and they are also the most dramatic. Style wise, they are undoubtedly versatile and go well with any style gown be it simple or extravagant, as long as it is full length. Best for church weddings, this ceremonious veil will take a lot of work to maintain throughout the day, so make sure if you do decide to keep it in place after the ceremony that you have one designated helper to assist you if you need it. Lastly, some practical tips you might need when it comes to looking and feeling secure in your veil on the big day. If you are wearing a dramatic length veil, and like most weddings you plan on getting a few picture perfect moments either outside your church or venue, you will need weights. Veil weights are little magnets or clips that secure to the end of your veil to ensure that while posing for a picture, your veil doesn't get carried away with every wind current that comes your way. Always make sure that the veil and the gown are complementing each other in terms of their style, and always do a test run with hair before the big day actually arrives. If you just make sure to put enough thought and preparation into your veil as you did your dress, you will confidently look and feel beautiful throughout the whole day.